1. Sarah Jane James: born January 15, 1834 in Bedford County, Virginia; married in 1851 to George W. Tindle (1823-1891); died 1913; known children include: Emma Tindle, Lisey Jane Tindle, David Tindle, Sarah Tindle and Alfred Tindle. 2. Mary Susan James: born May 15, 1836 in Bedford County, Virginia; married March 28, 1858 in Johnson County, Missouri to John J. Claunch (1836-1877); died May 7, 1905; known children include: Amanda Claunch, John William Claunch, George Washington Claunch, Joseph Harvey Claunch, Lewis Grant Claunch and Mary Delia Claunch. 3. James W. James: born circa 1837 in Bedford County, Virginia; married 1858 in Johnson County, Missouri to Jenetta Cochran (-1911); died September 4, 1897; known children include: Edna James, Noah James, John James, Fred R. James, Ann Rose James, Ida James ad Inez James. 4. Rhoda A. James: born circa 1838 in Bedford County, Virginia. 5. John N. James: born circa 1840 in Bedford County, Virginia; married to “Clarinda” (1847-? ); died June 27, 1888; known children include: John James, Sarah James, Julia B. James, Walter James, George James and Ida M. James. 6. George Washington James, Jr.: born April 16, 1846 in Bedford County, Virginia; married 1886 in Crawford County, Kansas to Alice Ann Burcham (1865-1944); died June 17, 1919 (aged 73) in Crawford County, Kansas; buried at Old Arcadia Cemetery, Arcadia, Crawford County, Kansas; known children include: Henry W. James, Silas Lincoln James, Stella May James, Benjamin Levi James, Maggie Alma James, Walter William James, Ida Elizabeth James, Clara Emaline James and Raymond James. 7. Jonathan James: born circa 1848 in Clinton County, Kentucky; married 1872 in Crawford County, Kansas to Louisa Katherine Archer (1855-1928); died near Braggs, Oklahoma; known children include: George Washington James, Daniel R. James, William Franklin James, Harrison James and Mary Ann Louisa James. 8. Noah James: born June 14, 1850 in Clinton County, Kentucky; married to Letti Arnold (-1938); died August 21, 1928 in Davenport, Oklahoma; known children include: William A. James, James Franklin James, Laura Elizabeth James, Ida Maqc James, Hazel Eva James, Roy Jesse James and Pearl James. 9. Rachael James: born 1856 in Missouri; married 1875 in Lamar, Missouri to Ewing Chancellor; died 1935 in Casey, Illinois; known children include: Francis Oscar Chancellor, Laura Belle Chancellor, Joshua Vernon Chancellor, Alice Josephine Chancellor and Otis Ewing Chancellor. 10. Virginia James: born 1858 in Missouri; married 1880 in Lamar, Missouri to James H. Bell; died 1929 in Los Angeles, California; known children include: Louis Bell, Cleveland W. Bell, Sadie Bell and Delphia Bell. 11. Calvin Joel James: born 1859 near Odessa, Missouri; married Amanda Claunch; died 1939 nearl Liberal, Missouri; known children include: Charles James, Mary James, Lillie James, Ella James, Minnie James and William James. 12. Martha Emaline James: born 1862 in Gross, Crawford County, Kansas; married William Long; died 1944 in Mulberry, Kansas; known children include: Della Melvina Long and Elbert Long. 13. La Fayette James: born January 12, 1864 in Gross, Crawford County, Kansas; married July 26, 1888 in Arcadia, Kansas to Mary Delia Claunch (1873-1939) of Johnson County, Missouri; died May 12, 1942 in Mulberry, Crawford County, Kansas; known children include: Bessie James; Flossie James; Joseph Arthur James; Ruby Nell James; Pearl Lena James and Rolla James. George Washington James (1812-1864) was the son of Jonathan James (1785-1843) and Polly Bandy of Bedford County, Virginia. Family Bible Record of George and Sarah Tindle. Find A Grave Memorial for George Washington James, Jr. (1846-1919) at Memorial ID No. 94665660, created by “VJS”, added August 1, 2012. 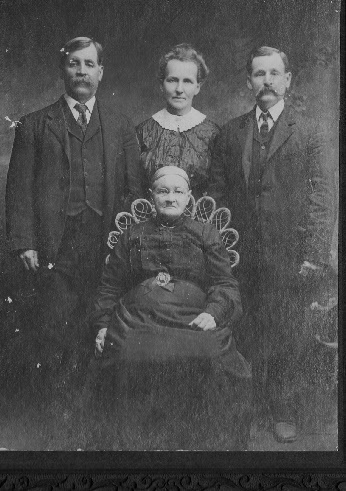 Below - George Washington James, Jr. (1846-1919) with wife Alice Ann Burcham (1865-1944), brother Noah James (1850-1928) and mother Elizabeth West.